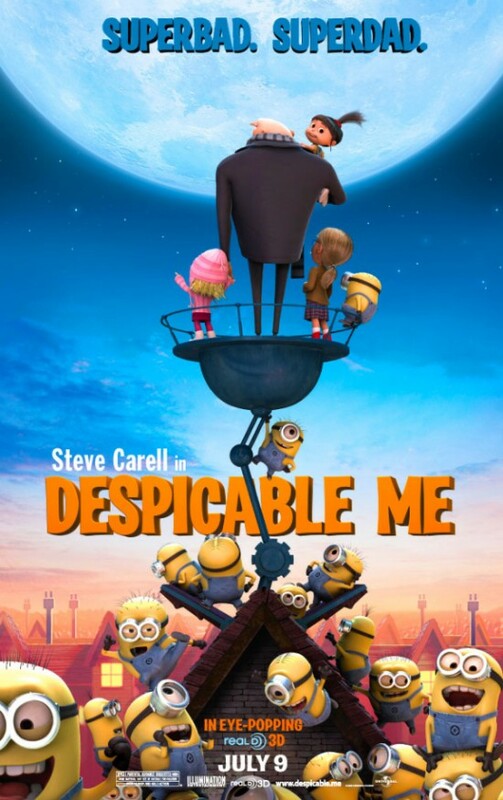 About a year ago I came across the first teaser trailer for a film called Despicable Me. It was a computer animated film, made by a studio other than Pixar, so that’s always hit or miss. Some non-Pixar films I enjoy – Monsters vs. Aliens – some I could have called the rest of my life complete without having seen – Ice Age 2. Now I realize that I am not the target audience for the majority of these films. Pixar has spoiled the world by creating films which universally resonate between all age groups. An 80-year old man could walk out of the film Up pining for his departed wife, while an 8-year old boy could walk out quoting his favorite lines from the character Dug. While I’ve yet to find a non-Pixar film which hits me on this kind of emotional level, I have at least found a couple which amuse and entertain. So when the first teaser for Despicable Me came out, I wasn’t sure what to make of it. To be fair, it was a teaser in the finest sense of the world, giving little to no information about the plot, just a quick flash of some words, some music and a slew of famous names who would be providing voice overs. (Which also tends to be a bad sign. If you have to sell your animated film by the fact that Julie Andrews is playing a bit part… not generally a sign of confidence.) 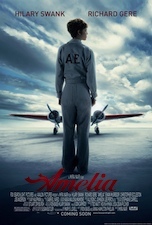 But as subsequent trailers came out, more details became available, and my interest level was at least somewhat stoked. So about the film. 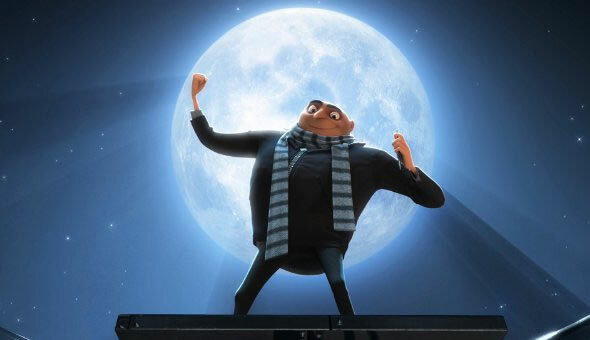 Despicable Me is about the world’s number-one super-villain, a large man with a heavy accent and pointy nose named Gru (voiced by Steve Carell). Gru is a villain in every since of the word, from popping the balloons of children, to cutting in line at Starbucks, and driving a vehicle which emits copious amounts of greenhouse gases, not to mention an army of loyal minions. All is going well until suddenly another contender enters the competition for number-one villain, a character by the name of Vector (voiced by Jason Segel). 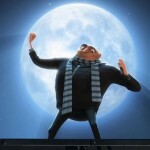 In an effort to reclaim his title as number-one villain, Gru concocts a plan to steal, what else, the moon. This plan becomes more complicated when three orphan girls come into his life. Now Gru has to balance the demands of being a villain with the new-found responsibilities of being a parent. 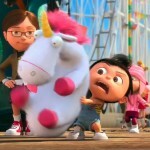 The line sure to boost the adoption rate - "It's so FLUFFY!!!" 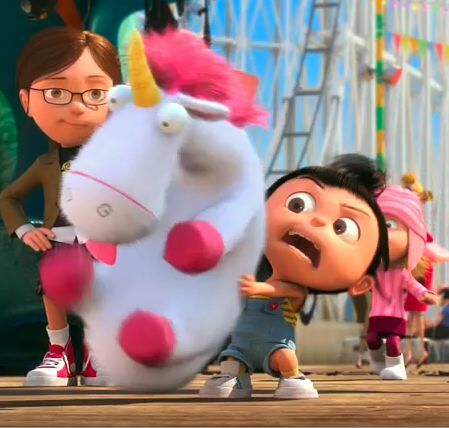 Ironically, my favorite part of the trailer sums up this film – “It’s so FLUFFY!! !” This film is a lot like cotton candy. It’s filled with fun-colored fluff which is enjoyable, but ultimately the substance is a bit lacking. Now, that’s not to say I didn’t thoroughly enjoy this film. I laughed almost throughout the movie, and it did have a pretty solid core to its plot. It just lacked that emotionally gut-wrenching essence that tends to exist in a Pixar film. Whereas Toy Story 3 gave me pause to reflect on my own life and find deeper connections to the characters and story, Despicable Me gave me some time to laugh and forget about the world for an hour and a half of simple entertainment – a valid purpose as well. I don’t want to downplay that this film does have an emotional and moral plot line. That’s all good. There is something a bit saddening in that probably 75% of the funny moments are captured in the trailer. But that’s the state of our world today. Trailers give away all the funny moments and when you get to the theatre you end up watching the trailer with 10-minutes of filler between each joke. Despicable Me still proves to be entertaining, and adds some good moments on top of those presented in the trailer. Plus, it throws in a few zingers only adults will pick up on, so keep an eye out for those. 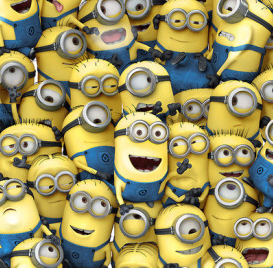 Random Untrue Fact: Every minion has a dollar sign tattoo somewhere on his body. The minions steal a bit of the limelight of the film, much like the penguins of the film Madagascar. They provide much of the humor which resonates with smaller children, and the part of all adults that wants an excuse to laugh at silly sounds and goofy antics. In a lot of ways they remind me of the Rabbid characters from the “Rayman Raving Rabbids” series. They were a nice addition to the film, and since they’ve already greenlit both a sequel to the film, and a spin-off for the minions. The question will be if they can stand up on their own without something of substance to back them up. I heartily endorse seeing this film. It won’t tug very hard at your heart strings, but you will be entertained, you will laugh, and you may want to run out and adopt the smallest child that can utter the phrase “It’s so FLUFFY!! !” as soon as the lights come up. Also, stick around through the first part of the credits, especially if you’re seeing it in 3D. The minions come out and play with the 3D effect. We saw it in 2D, so this wasn’t quite as amusing, but I still don’t feel it would have been necessary to spend the extra money to walk out of the theatre with my depth-perception temporarily altered. But that’s just me.